A gas plasma consists of a collection of ions, free radicals, and electrons produced when a gas is transformed to a high energy, excited state by exposure to an energy source under the right physical conditions. Natural plasma examples include lightning, fire, and the Aurora. Plasma treatment is a process by which the surface of a material is modified in some way through the actions of the dissociated molecular components of a gas. Because these components are in such a high energy state, they are very chemically reactive and can easily affect changes to the surface of materials. The changes that occur are complex and dependent on many variables including gas chemistry, process pressure, and the surface chemistry of the material being processed. A key advantage to plasma treatment is that only the surface (first several molecular layers) of the material are altered; the characteristics of the bulk material remain the same. The process occurs near ambient temperatures without employing toxic chemicals. In etching and cleaning processes, unwanted material is removed from the surface of the substrate using a relatively high energy plasma. The process breaks the contaminant molecules into smaller pieces which are volatilized and are then swept out of the CHAMBER by the vacuum pump. Surface activation processes work by altering the first several molecular layers of the bulk material through incorporation of chemical functional groups that increase the surface energy of the material. This leads to improvements in the adhesion and wet ability of the treated material. Plasma processing in Glow Research plasma systems is accomplished through the use of a low pressure, RF induced gaseous discharge. The material or specimen is loaded into the reaction CHAMBER. The CHAMBER is evacuated to a mild vacuum by a mechanical vacuum pump. A process gas is drawn through the CHAMBER over the specimen increasing the CHAMBER pressure, depending on the application. RF power is applied to the CHAMBER at a frequency of 13.56Mhz., or 100 kHz. This excites the process gas atoms or molecules and dissociates them into chemically active species. These species are very short lived and recombine to form the original gas molecules as soon as they are carried out of the reaction CHAMBER. The plasma byproducts (unused process gas and volatilized material from the sample surface) are carried away by the vacuum. These steps are flowcharted on the next page. Process gas(es) selected for use. 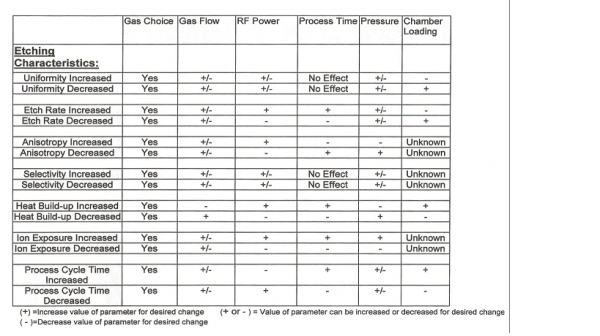 Flow rate/pressure of selected gas(es). Amount of RF energy applied to the vacuum CHAMBER. Amount of time material is exposed to the plasma. Process pressure, RF power, and treatment time are the primary factors that affect the intensity of the treatment. For example, a high energy treatment would be run under conditions of relatively low pressure, high power, and long treatment time. Conversely, a low energy treatment would be run under conditions of relatively high pressure, low power, and a short treatment time. Since every material has different treatment requirements and many factors need to be taken into account, it is difficult to say what type of treatment will give the desired .results. A general rule would be that energetic processes are better for cleaning and etching applications; more moderate processes are better for surface activation applications. The matrix on the following page is intended as a general guideline to help the operator develop an etching process by manipulating the system variables. It must be noted that the plasma etching process is extremely complex and is not easily characterized. In offering this information, Glow Research makes no claim as to its applicability in tailoring operator controllable parameters to achieve specific etch characteristics. It is offered only to illustrate how altering an operator controllable parameter might effect an etch characteristic. Anisotropic: Etching that is directional in it’s action with characteristic etch path side walls that are perpendicular to the electrode plates of the etcher. Characteristic of etching applications where the preservation of underlying material is desirable. Typical of reactive ion etchers(RIE). Auto tuning System: An RF system that will automatically tune the RF matching network for minimal reflected power so that there is optimal power transfer to the CHAMBER. Base Pressure: The pressure at which the plasma process begins. The lower the Base Pressure level, the less impurities will be present in the CHAMBER when the process gas is introduced. By evacuating the CHAMBER for a longer or shorter period of time at the commencement of the process cycle, more or less of the room air and water vapor present in the CHAMBER will be pumped out before the process gas is introduced. Also referred to as Process Threshold Pressure. Endpoint: The point at which a material has received satisfactory treatment. Most commonly used in reference to cleaning processes. Etch Rate: The rate at which material is removed during exposure to plasma. Often given as a value of Angstroms per minute. Forward Power: The amount of RF energy applied to the plasma. This value is measured in watts. Isotropic: Etching that is not directional in its effect. Characteristic of most cleaning applications where it is desirable to remove material from all surfaces. Typical of barrel type etchers. Impedance Matching: The matching of the fixed output impedance of the RF Power Generator to the constantly varying input impedance characteristic of a plasma. This is done to attain maximum transfer of available RF energy to the plasma and keep the plasma uniform. Matching Network: The module in the plasma system that accomplishes the matching of the fixed output impedance of the RF Power Generator to the constantly varying input impedance characteristic of a plasma. Parameter: A variable in the plasma process that can be changed by the operator. A value chosen for the specific parameter is passed to a controlling device in the plasma system which will then regulate the plasma generation process accordingly. For example, RF Power Level is a parameter; a typical value assigned to this parameter would be 100watts. Plasma: A highly energetic state of matter produced when a gas is Introduced into a CHAMBER at low pressure and is excited by the application of RF energy. This results in a disassociation of the gas molecules into ions, free radicals and other reactive species which interact physically and chemically with exposed surfaces of materials. Process: The plasma cycle. The complete sequence of steps a material is subjected to in order to attain desired results. A process can consist of single or multiple steps. Process Recipe: A sequential listing of the total set of conditions which make up a process. 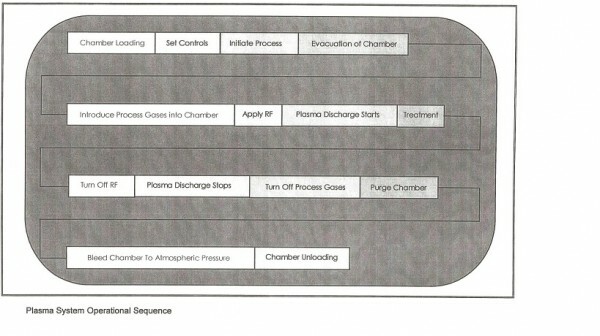 This includes gas type and process parameters as well as sample loading and positioning in the treatment CHAMBER. Process Threshold Pressure: The pressure at which the plasma Process is started. The lower the Process Threshold Pressure level, the less impurities will be present in the CHAMBER when the process gas is introduced. By evacuating the CHAMBER for a longer or shorter period of time at the commencement of the process cycle, more or less of the room air and water vapor present in the CHAMBER will be pumped out before the process gas is introduced. Also referred to as Base Pressure. Pump-down Speed: The amount of time required to reach Base (Threshold) Pressure once the CHAMBER is placed under vacuum. Radio Frequency(RF): The frequency range of the power generators Used to create the plasma in the AUTOGLOW equipment. The specific Frequency is 13.56MHz. Reactive Ion Etching(RIE): A high energy plasma process. Due to high energy ion bombardment, material to be etched can be removed quickly. Read point: Actual value of a parameter at any given time as monitored by that parameter control device’s sensors and reported for the operator’s information on the appropriate panel DISPLAY. Reflected Power: The amount of RF energy that is not successfully transferred to the plasma, due to an impedance mismatch. May also be referred to as Reverse Power. Reverse Power: The amount of RF energy that is not successfully transferred to the plasma, due to an impedance mismatch. May also be referred to as Reflected Power. Selectivity: Different materials have different etch rates when exposed to the same plasma. This phenomenon can be manipulated to control, through process parameter selection, the etch rate of separate components of a multiple substance device to preserve one material while removing another. Set point : The value of a parameter entered into one of the system’s control devices. Once set, the control device will keep the parameter at the set point through out the course of the process. Threshold Pressure: The pressure at which the plasma process begins. The lower the Process Threshold Pressure level, the less impurities will be present in the CHAMBER when the process gas is introduced. By evacuating the CHAMBER for a longer or shorter period of time at the commencement of the process cycle, more or less of the room air and water vapor present in the CHAMBER will be pumped out before the process gas is introduced. Also referred to as Base Pressure. Tuning: The process of controlling the settings of the tuning network components to effect best possible impedance matching. This can be performed through manual input from the operator or through an automatic function, where by forward and reverse power levels are compared and feedback is generated from that comparison which is used to set the value of the variable components. Tuning network: A coupling network by which impedance matching is controlled and optimized by varying the phase and amplitude of the RF waves entering the treatment CHAMBER. Alteration of these values compensates for any mismatch in impedance as the network couples the RF power to the CHAMBER. Ultimate Pressure: The minimum CHAMBER vacuum level achievable, as indicated by observation of the CHAMBER pressure after it has been subjected to vacuum for a period of time sufficient for the pressure reading to completely stabilize. The capacity of the vacuum pump, the dimensionsof the connecting line between the vacuum pump and the CHAMBER, and the overall vacuum integrity of these components all affect the achievable Ultimate Pressure. Ultraviolet (UV)Light : The region of the electromagnetic spectrum just beyond the visible wavelengths. The plasma environment is rich in UV light and this is one of the elements contributing to the surface modifications created by plasma. Uniformity: The degree to which the plasma process gives a uniform Treatment across a materials surface. Also can refer to the degree plasma Uniformity inside the CHAMBER. PLEASE KNOW THAT WE ARE AT YOUR SERVICE!